Prince Fielder was 12 years old when he first made a name for himself in Detroit. The stocky teenager and son of slugger Cecil Fielder put on an unbelievable power display at Tiger Stadium, blasting a series of prodigious home runs during batting practice. Fifteen years later, Fielder is returning to Motown to do it again, this time in actual major-league games. The Tigers just shocked the baseball world by signing the most coveted player left on the market and giving him a nine-year, $214 million contract, the fourth-richest ever. Fielder will earn $23 million in each of his first two years and then make $24 million annually in the final seven seasons, according to terms obtained by the Associated Press. If he wins the American League Most Valuable Player award, he earns an additional $500,000. If he's second through fifth in the MVP voting, it's worth an extra $200,000, while sixth through 10th nets a $100,000 bonus. Each MVP award he wins after the first one gives him $1 million. He also gets bonuses of between $50,000 and $100,000 for various and assorted awards and honors … plus a hotel suite on the road. Much has changed since Fielder's jaw-dropping performance. The Tigers moved from their old ballpark into Comerica Park. Fielder was drafted by the Milwaukee Brewers and became one of the game's best players. And he and Cecil — his former co-star in a McDonald's commercial — had a falling out that has been ugly at times. 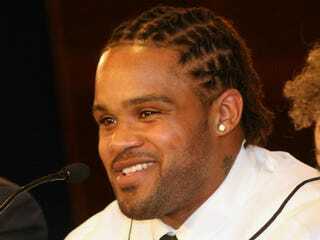 But Prince Fielder was all smiles at Thursday's news conference, saying "dreams come true" when the Tigers introduced him. "This is awesome," he said. "I just never thought this could happen." Of Major League Baseball's four contracts worth more than $200 million, Fielder's is the first to go to an African-American player. Alex Rodriguez has signed two of them: $275 million from the New York Yankees and $252 million from the Texas Rangers. Albert Pujols signed a $240 million contract from the Los Angeles Angels last month. It probably wouldn't have happened for Fielder — at least not in Detroit — if not for an injury to Tigers designated hitter Victor Martinez. Detroit wasn't interested in a long-term deal with Fielder until Martinez hurt himself. That's when 82-year-old team owner Mike Ilitch insisted on having the player he remembered as a little child. "I figured we had to do it," Ilitch said. The Tigers reached the American League Championship Series last season and are among the favorites to reach the World Series this year. Ilitch wants to win the crown; now he's got his Prince.